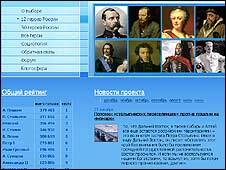 Former Soviet dictator Joseph Stalin was beaten by medieval prince Alexander Nevsky in a poll held by a TV station to find the greatest Russian. Stalin came third, despite being responsible for the deaths of millions of Soviets in labour camps and purges. Alexander Nevsky fought off European invaders in the 13th century to preserve a united Russia. In second place was reformist Prime Minister Pyotr Stolypin, who was assassinated in 1911. More than 50 million people voted by phone, the internet or via text messages in the poll held by Rossiya, one of Russia's biggest television stations. The voting took place over six months as 500 original candidates were whittled down to a final 12. Stalin - an ethnic Georgian - was riding high for many months and was in the number one slot at one point until the show's producer appealed to viewers to vote for someone else, says the BBC's Richard Galpin in Moscow. Stalin sent millions of people to their deaths in the work camps of the Gulag. Millions more perished in political purges or during the forced collectivisation of farms during his rule from the 1920s to his death in 1953. 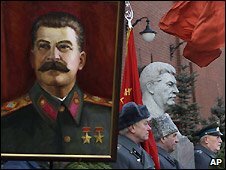 Many in Russia do still revere Stalin for his role during World War II when the Soviet Union defeated the forces of Nazi Germany. But now there is a much broader campaign to rehabilitate Stalin and it seems to be coming from the highest levels of government, says our correspondent. "We now have to think very seriously, why the nation chooses to put [Joseph] Stalin in third place," said actor and film director Nikita Mikhalkov, one of the contest's judges, after the results were released. Nevsky fought off Swedish and Germanic invasions to preserve medieval Russia. He also pursued a conciliatory policy with the powerful Mongol rulers to protect Russia's eastern flank. He was canonised as a saint by the Russian Orthodox Church in the 16th century. Stolypin is remembered for his attempts to modernise agriculture and stifle leftist revolutionaries as prime minister under Tsar Nicholas II.